Every person on this planet is scared of Heart attacks and other dreadful life-threatening heart diseases. You don't have to make big differences in your daily health regimen to keep your heart healthy naturally. Heart Attack Symptoms are often different. Before I jump into the nuts and bolts of how to keep heart healthy naturally, I want to review what is a heart attack and types of heart diseases. A heart attack can be defined in easy terms as sudden blockage of blood flow to the heart muscles. the blockage of an artery can be due to building up of plaques in coronary arteries or thrombus formation or narrowing of arteries. A most common type of heart disease you will find is CAD (coronary artery disease) in which coronary arteries don't get enough blood and oxygen due to blockage of the artery. This may cause sudden death without warning. Other common types of heart diseases include -Abnormal heart rhythm (arrhythmias), heart failures, heart valve disease, congenital heart disease, Infarctions, and Ischemias. Actually, this is a very broad topic of types of heart disease which is even difficult to diagnose for the doctor as well. I will try to cover some important related topic especially treatment part in future. Studies have shown people who are less active are more prone to heart attacks than the active people. Healthy Dietician said Aerobic exercises are most beneficial for the heart. Cardiovascular exercises increase blood flow towards the body and also widen up blood vessels. Morning and evening brisk walk is also effective for the heart. No matter how much you busy carve out time to make your heart-healthy diet. An unhealthy diet full of trans fat, sugary and salt-laden foods can contribute to weight gain, high blood pressure, and raise in cholesterol level in blood - all of which are risk factors for heart disease. Below I have shared about lists of foods good for heart health. In the 21st Century, it is more common to have stress in life- whether you be at the office or home and these stressful circumstances increases heart disease risk. Embrace stress-free life and live healthily. Smoking is a significant villain in heart health. Chain smokers are twice likely to have a heart attack than a normal nonsmoker. Chances increases if you are active smoker or history of smoking cigarettes. Binge drinking can lead to raising triglycerides in the blood and further chances of heart stroke and obesity majorly. The lesser the picture of alcohol in your mind the easier on cut alcohol and save your heart. If you really have sugared tooth, it's hard for you to limit processed sugar or sugary products but you can revive sweetness in your diet through fruits and natural yogurts. Heart disease and diabetes are interlinked by conscience. Eating too much sugar or processed sugar lead to weight gain, which increases blood pressure and risk of heart diseases. Bad fats sources include fatty cuts of beef, pork, and lamb and high-fat dairy foods. These fats elevate the harmful LDL cholesterols in blood and decrease the good high HDL cholesterols which are very dangerous to heart health. Whereas, monounsaturated fats are one of the types of heart-healthy fats, commonly found in olive oil. Maintain a healthy weight by targeting BMI(Body Mass Index) below 25. Red meats are high in saturated fat which is bad fat for health and their consumption increases blood cholesterol and thereby increases the risk of heart diseases. Studies conducted in 1990 and before claimed that red meat cannot be part of a healthy diet. The new evidence stated when red meat is taken in moderation can be a part of the heart-healthy diet. Unbearable pressure, fullness, squeezing feeling in the chest. Pain or discomfort in one or both arms, in most cases, the left side is more painful. Shortness of breath or dyspnea. 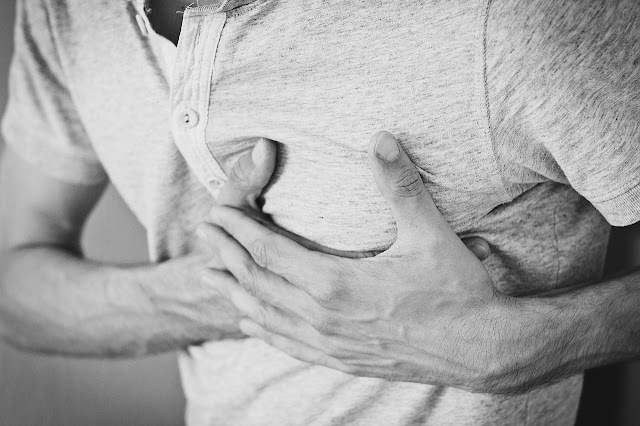 While chest pain may be the most common symptom of heart attack, but not all people experience the same. Some people don't experience any symptoms at all. Heart attacks that occur without any symptoms or very mild symptoms are called silent heart attacks. 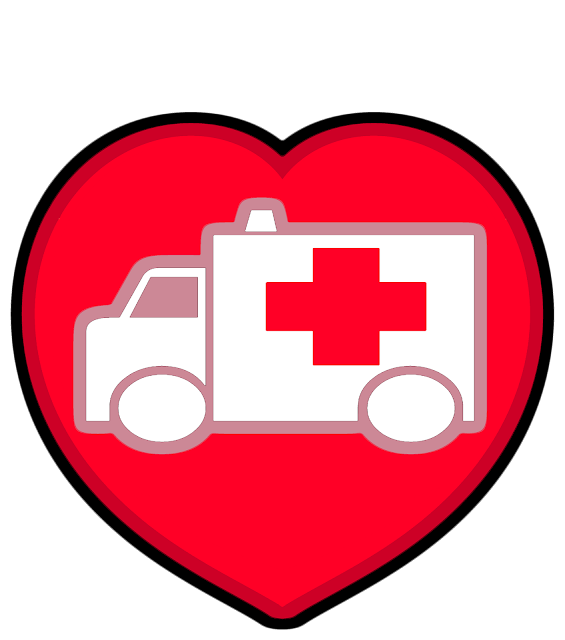 Heart Attacks are medical emergencies and everyone should know heart attack first aid. Ohh! way back heart attack taken thousands of lives in seconds and ever since it introduced has become super medical emergencies. Many people consider themselves a healthy living being and when they actually getting these symptoms they misdiagnose the symptoms because they don't think it could happen to them. So in future, if you or anyone around you experience the above signs and symptoms, please take the following steps. Seeking help from others is primarily important because you cannot handle yourself by own. Dial 9-1-1 immediately if you get above symptoms for a longer period. Make sure you follow the operator's instructions and get to the right hospital. Calling 9-1-1 is an immediate thing you should do and an operator may recommend you to take one aspirin. Definitely, you can reduce the risk of heart and circulatory diseases from developing by making a healthy choice of foods on an everyday basis. I know you guys need a detailed and comprehend on Best foods for heart patient which I'll surely cover in my upcoming post, so till then stay tuned with Eureka Of Life. I hope guys this helped you and gave enough information. Macadamia Nuts are the nuts with sweet, crunchy, flavorsome, delicious taste and full of energy source and health-benefiting nutrition obtained from Macadamia tree originated from the North Eastern part of Australia. Macadamia nuts are very hard, woody and rough brown kernel from outside and have seeds inside which are actually edible part(white) of the kernel. Macadamia nuts are also commonly called Australia Nuts, Bush Nuts, Queensland Nuts, and Hawaii Nuts. Macadamia nuts are the most expensive nuts in the world. Macadamia Nuts are the most expensive nuts in the market because macadamia tree produces fruits only after seven to ten years of fruitful nurturing with fertile soil, heavy rainfall, and free space. Raw nuts like Macadamia nuts have been proven to help the trim waistline. Universities and other research centers experimented that people who excluded nuts from their diets or substituted with other foods have gained weight rather than trimming down. Macadamia nuts contain 'zero' trans fat(bad fats) and 12g of monounsaturated and polyunsaturated fats in 100g of serving. It delivers 23% i.e. 8.6g of the daily recommended value of dietary fibers. Due to its high protein deliverables of 7.91g, it is recommended for building muscles. It is a high energy source approx 720kcal. It is a rich source of iron. High supplier of essential Vitamins. Rich in minerals like potassium and calcium. 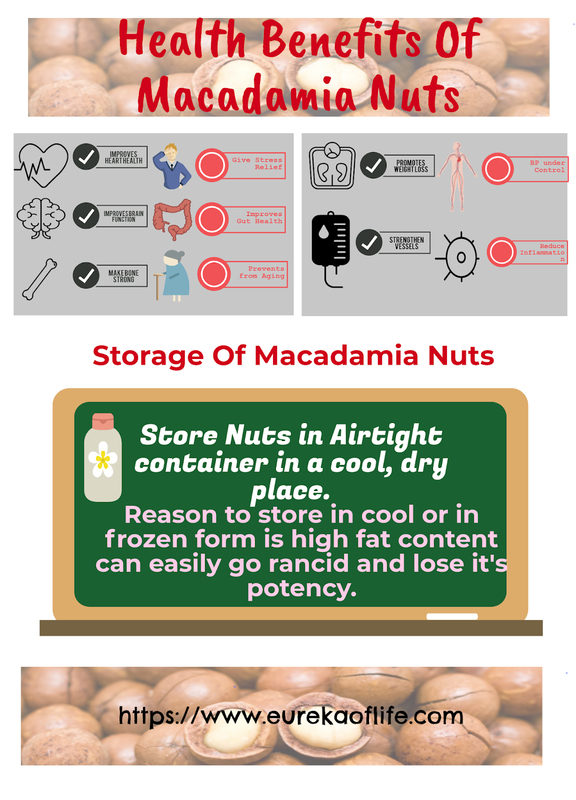 Macadamia Nuts having plenty of benefits healthwise which are described below. Macadamia nuts contain zero trans fat. Trans fatty acids usually raise your bad LDL and which make you prone to heart diseases. Not only this science has proven that trans fat lowers the good HDL cholesterol which is more dangerous. Macadamia nuts are far far away from above repercussions. Macadamia nuts contain a generous amount of monounsaturated omega-9 fatty acids called oleic acids supports healthy fats and keep the heart healthy. Selenium is a cardioprotective trace element which macadamia nuts of 100g serve 3.6ս and supports good health of the heart. Macadamia nuts have shown a decrease in glycemia in a diabetic patient who consumed theses nuts continuously as compared with diabetic people who not consumed these nuts. Bioactive compounds, minerals in these nuts balance the blood sugar level optimally. Macadamia nuts are categorized to healthy snack and associated with weight loss. Many of you might be thinking macadamia nuts 60% is fats then how come help in weight loss. But 34% of dietary fibers mainly bring this magical change. Soluble dietary fibers form a bond with water and give satiety. This way macadamia nuts help weight loss. In addition, macadamia nuts are the good source of palmitoleic acids which is a type of monounsaturated fatty acids with excellent fat metabolism property. This high fat snack contains net 1.6g of low carb at one serving which is another proven low carb food contributor in weight loss. Since macadamia nuts are gluten-free, it is beneficial in gluten-free diet formula. Gluten-free foods are great alternatives for gluten allergy and celiac disease, so here come nuts like macadamia nuts. Blood Pressure has a direct link with minerals present in nuts. Nutrients like Sodium and Potassium keep blood pressure in check. Macadamia nuts could help you maintain healthy blood pressure. Almost every nut, cashews, almonds, walnuts, brazil nuts, pecans contain amino acid l-arginine which juggles with multiple vascular benefits especially people with coronary heart disease and vascular diseases. Macadamia Nuts contain an adequate amount of Vitamin A and Vitamin E and fat-soluble fibers which are potent antioxidants and protect cell membranes from harmful free radicals. Oxidative degeneration brings early damage to tissue means collagen lose its elasticity and activity. So nuts prevent you from all these deteriorations and make you look younger. Macadamia nuts are the great source of Calcium, Magnesium, and Potassium which contribute to bone strength and bone demineralization. The study suggested that macadamia nuts help relieve inflammation. Also, Macadamia nut oil is best in treating inflammation. Inflammation is the main cause of diseases like heart diseases, cancers, diabetes, and weight gain. Nuts fight for all these diseases and prevent our body. Macadamia nuts are the good source of soluble and insoluble fibers - flushes toxin out. Macadamia Nuts also a good source of B-complex Vitamins like thiamine (B1), Pyridoxine (B6), Niacin(B7), and Riboflavin(B2). Vitamin A plays an essential role in brain function and mood elevation. Omega-3 fatty acids in these nuts help to make mood happy. Making it a go-to snacks can regularly fulfill the daily recommended value of vitamins and other minerals. Nourish the brain function with an outstanding source of copper, vitamin B1, manganese in this nuts help in the production of neurotransmitters, brain and cognitive function takes place effectively. Macadamia nuts are the most expensive nuts in the world. National Macadamia Nut day is celebrated annually on September 4th. The United States is the highest consumer of Macadamia nuts and Japan places distantly at the second position in the world. The largest production of Macadamia nuts is cultivated on the island of Hawaii. Macadamia nuts are not plucked from the tree instead fallen after they ripen. Macadamia tree produces nuts only after success reaps of a tree for 7-10 years along with requires adequate rainfall and fertile soil. Takeaway: Include handful of Macadamia Nuts buttery, fresh, delicious nut in your diet for better health.